News of shootings, racial disharmony, economic distress and personal despair find us struggling to live out our hopes. Through the thick static of misery, I share a story of hope for humanity. Elaine Simpson of Birmingham, Michigan visited Chicago for business. As Simpson was checking out of her hotel she discovered that her wallet was missing. In her wallet were priceless family photos, credit cards and about $150 in cash. She filed a police report and a hotel worker loaned her $60 to for a taxi to the airport. CBS Chicago’s Mike Parker tracked down “Sid” in Chicago. Dr. Fazal Siddiqui, (Sid) is a retired physician who said he found the wallet on the back seat of a taxi outside Navy Pier. 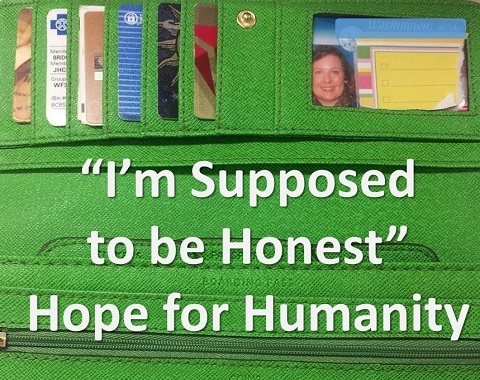 “I’m supposed to be honest because I am a Muslim. It’s my faith, my teaching,” he said. Dr. Siddiqui expressed his humanity by being honest and generous. He took time and effort to return treasured possessions to a woman he’d never met. And a hotel worker helped a stranded traveler settle her hotel bill, file a police report and even loaned the traveler taxi fare to the airport. Simple acts of kindness help heal the world. How can we extend care and compassion to others and help heal a hurting world? Please consider supporting the impactful work of the Pacifistic Pugilistic Benevolent Society, where I am an emeritus member. I have my voting sticker, but I wish my finger was purple. Exercising my franchise, I went to my early polling place and voted on the offices and referenda that will govern our civic life. Walking home from the polling place, I thought of the time in 2008 when I sat at a raucous dinner party in Nepal. The men I dined with talked eagerly of family, faith, law and politics. The representative democracy in the United States intrigued my companions and I struggled to recall the intricacies of my civics lessons. To my immediate right sat a man with a purple finger that looked as if he had whacked it with a hammer. I asked him what he did to his hand. 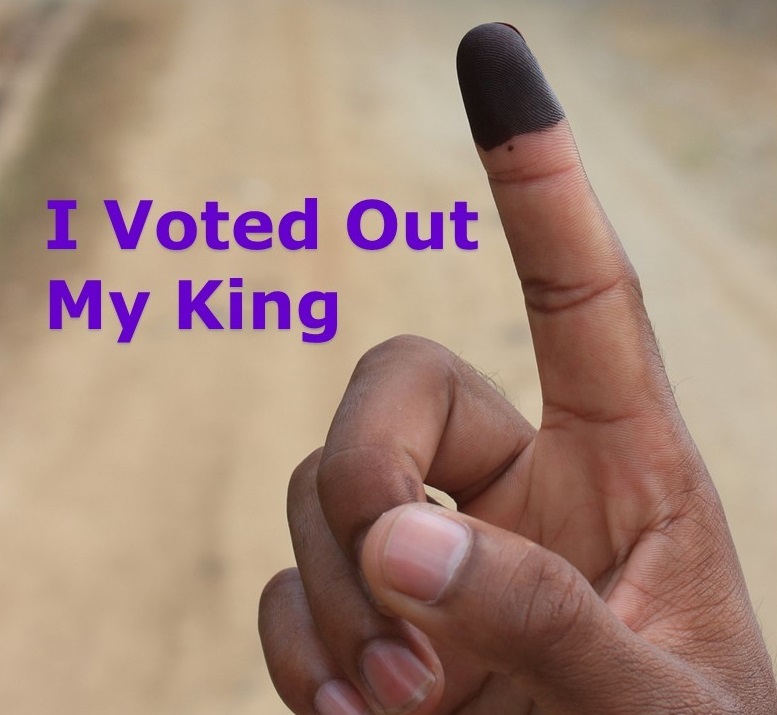 He lifted his finger, looked me in the eye, and said, “I voted out my king.” The ink on his finger indicated he’d voted. When Samuel Adams and John Handcock began imagining a revolution against England’s King George III, the consolidation of Nepal was completed and a monarchy formed. Since 1768 the monarchy survived insurrection, invasion, and intrigue until the public ousted the king in 2008. Just prior to my arrival the Nepalese men and women elected to remove the monarchy and install a constitutional democracy. The democratic leaders were in the public and messy process of drafting a constitution. We no longer need the courage to oust a king or the wisdom to write a constitution. What we require is the attentiveness to responsibly inform ourselves about the issues of our day, check our prejudices, and select the candidates who possess the character to address national and global challenges. The foundations of our government and the perpetuation of our ways of life depend on our responsible citizenship. Holding a crisp $100 bill high in the air a wise man asked a crowd of people, “Who would like this $100? Hands rose throughout the room. He said, “I’m going to give this money to someone in the room, but first let me do this. He crumpled the bill into a little wad and asked, “Who still wants the money?” The hands remained aloft. ‘What if I do this?” He dropped the money to the floor and ground it into the floor with his shoe. He picked up the soiled and smashed bill and asked, “Now, who wants the money?” Every hand was still raised. Many times in our lives, we are dropped, crumpled, and ground into the floor by the decisions we make and the circumstances that come our way. We feel as though we are worthless. But no matter what has happened or what will happen to you, your value never diminishes. 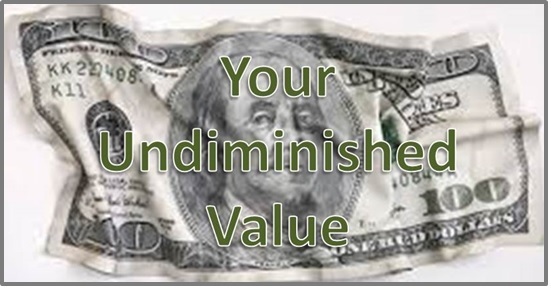 You are valued and, unlike a $100 bill, your crumpled, soiled and stomped self is more valuable for the experience. Do you ever sense you’re in water over your head? When starting a new job, relationship, or task, we often feel that there is too much to know, too much to learn and not enough time to do it all. When I’m faced with such a feeling I remember an African folk tale of the frogs that fell into a milk pail. The rising sun creased the morning sky and it was time for the day to begin. A farmer arose from his bed and went to milk his cows. Finishing the milking, the farmer left the bucket of milk and went inside to make his breakfast. “Keep swimming,” said the other. “We will get out somehow.” The frogs kicked in the milk again and again. But they couldn’t reach the top of the bucket. But the first frog had already given up. “I’m going to die anyway,” he said and stop swimming. As soon as he stopped moving, he sunk in the bucket of milk and died. The other frog wouldn’t give up. He paddled and kicked even when he was exhausted. Slowly, all that swimming turned the milk to butter. The frog realized he could now jump out. He pushed his legs on the solidified butter and jumped to his freedom. He was alive because he wouldn’t give up. When you feel in over your head and that you’ll drown in all the details, keep paddling and kicking and soon the ground will rise to meet you. If you keep moving, the confusion will clear and you’ll find a new level of comfort that will set you free. Have you ever felt in over your head? Let me know how you kept swimming until you succeeded. On May 4, 1970 soldiers from the Ohio National Guard encountered Kent State University students protesting against the U.S. invasion of Cambodia. The Guardsmen opened fire on the unarmed students killing four and wounding nine others. The day after the shooting, students from Southern Illinois University marched into the McDonald’s restaurant in Carbondale, Illinois demanding that the U.S. flag flying outside the restaurant be lowered to half-staff to honor the Kent State students. The McDonald’s manager complied. A neighbor, who happened to know McDonald’s founder, Ray Kroc, phoned Kroc to complain about the lowered flag. Kroc called the Carbondale manager and insisted that the flag be raised again to the top of the pole. The flag was raised. Caught in a crisis? 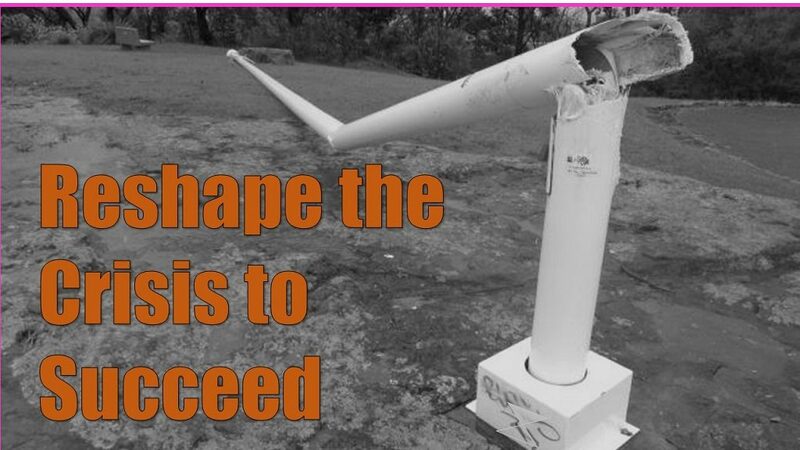 The next time you feel stuck, look for the flagpole and ask yourself, “How do I knock it down?” Reshape the crisis for success.